Acumen Disc has a copy system that fits your needs. 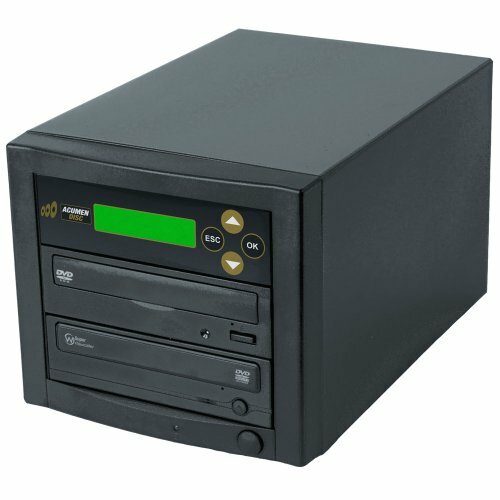 This Duplicator unit features single target DVD/CD burner (non-branded on the front panels) for writing blank media discs with a reader rom for master disc. Duplicator that can easily backs up your digital files including photos, music, documents, data, and more. The professional duplicator from Acumen Disc does it all at lightning speeds up to highest level for DVD burning. No computer or software needed, no setup required, and no confusing buttons to push, it automatically starts and finishes the job. The LCD display panel is an easy read display with 2 line. Our Duplicator are a reliable, professionally built system that is easy to use. All you need to do is putting in the discs. Accessing, storing, and sharing digital files has never been this easy and fun. Disc duplication doesn't have to break the bank or tie up a computer. This 1 reader with single burner duplication system that is designed for users who need to do multiple copies with the needs to get jobs done in short amount of time massive. It is a complete stand-alone system so you can use it anywhere that you have power. Just plug it in, insert your source and target discs and let the drive take care of the rest. Fitted with a user-friendly LCD interface, the copy tower burns CD and DVD discs at an optimal speed every burn cycle. Burning speeds are adjustable and other standard menu features are available for advanced users. Our duplicators are easy to use and are the best value in the market. Acumen Disc has the solution for all your duplication needs. IMPORTANT NOTE: Our Duplicators does not copy any Encrypted, Copyright, Copy Protected DVDs/CDs, and Video games. Including store bought or rental discs. HIGHLY RECOMMEND: Use Duplicator Grade or higher grade quality disc to make your burning more efficient with professional results.